The kitchen will be a work in progress for a while longer. The cabinets, countertop, sink, and cooktop are in, but the plumbing probably won’t be installed until spring. As a temporary measure I’ve modified an old galvanized steel cooler to serve as my kitchen faucet and water supply. It works fairly well even though it does have a low flow rate. 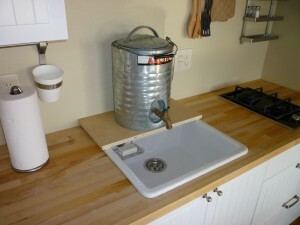 I can even add water heated on the cooktop or wood stove to it if I need warmer water for dishes. 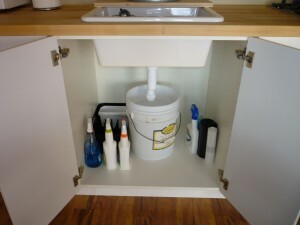 For the waste water I have a 5 gallon bucket hidden under the sink. A question I’ve already been asked is: where’s the refrigerator? I tried to find a refrigerator that was solar friendly, under the counter, and reasonably priced, but couldn’t. The closest I could find was a Coleman Stirling Power Cooler. It’s very energy efficient and runs directly off 12VDC, but it only has a 26 quart capacity and is in the shape of a cooler. What I really want someday is a Steca PF 166 refrigerator/freezer. The Steca would have six times the volume of the Coleman and wouldn’t use much more power – they claim it can run off a single 70 watt solar panel. Since neither of these can be readily installed into a standard kitchen cabinet, I decided to make space for the refrigerator in the storage room, which is also where the 12VDC power outlets are. I also passed on a range in favor of a simple two burner propane cooktop. I didn’t plan to do much baking at the cabin, and I would have hated to lose the cabinet – I need all the storage space I can get. For the few times that I might want to bake something, I plan on getting the Omnia Oven that lets you bake on a cooktop. It’s only $50 or so and gets good reviews from the boating community. The microwave oven that you see in the pictures will probably end up going away. Since my power inverter is only 300 watts, I can only operate the microwave when the generator is running. The plan is to eventually rely solely on the solar panels and not have the generator up there at all. Here’s a closeup of the temporary water supply and disposal. I can’t help but think there’s a Jeff Foxworthy joke for this: “You might be a redneck if your plumbing is a five gallon bucket under the sink”. Genius & cute! I have an idea… Maybe get a big barrel and put it in a nearby tree (or a little tower if you can manage that) then run a hose. You’ll get fantastic water pressure! If there’s room on top of the tin can, you can put it up there too. Put a wide, conical tin cone on top to keep the theme going and build a tin body below to make the Tin Man from Wizard of Oz. I really wish I could put a water storage tank outside or in the attic. It would free up some space in my storage room and provide water pressure without a pump. The problem I have is the cold climate here. It would be unusable for at least five months of the year, and would need to be winterized in the fall and de-winterized in the spring. I’m working on a water system that can be used in the winter with a minimum of work. I’ll post about it sometime this spring when I start working on the cabin again. Is there a well on property? maybe you can use the idea of the of the water jug up high, but a small one with a drain valve, and a hand pump to fill it. FOr example if you going to be showering/cooking/washing dishes/performing surgery/ect, you could use a hand pump to transfer it to said container. When you finish, use the purge/drain valve in the winter months to empty before freeze? I do have an old well, but it needs to be restored. Someone stole the old cast iron pump many years ago and dropped the pipe deep into the well. It’s not going to be easy getting that out. The only way I could get a water storage container up high enough would be to place it in my unheated attic. I still want to be able to use my water system when I’m there in the winter, so any water storage will need to be inside. Although it’s not finalized, I will probably use a hose from a hand pump on the well to fill my indoor storage tank. Something along the lines of an RV water hookup. I’m interested in what your cold weather solution to the water supply is. 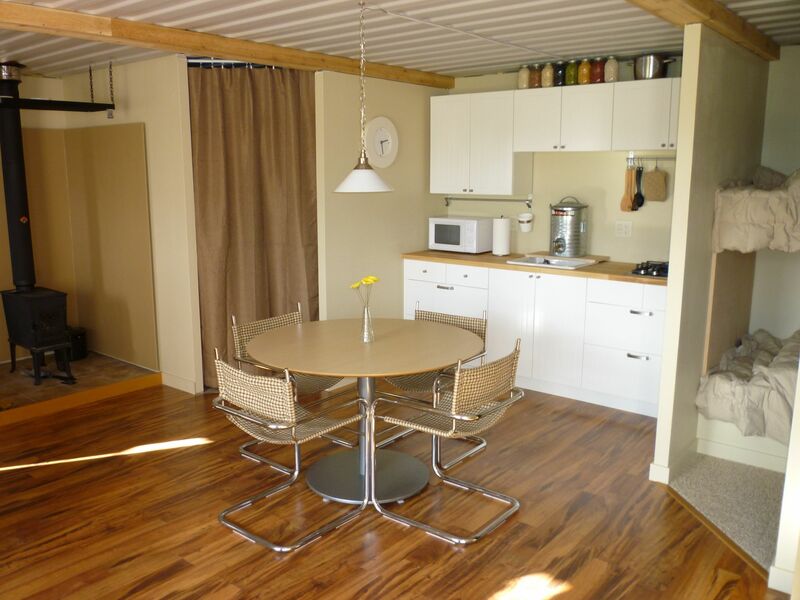 I live in Alberta and would like to develop a family holiday spot similar to what you are doing with shipping containers, but struggle with the water supply issue. 1. use an 8′ frost free hydrant plumbed close to the cabin and simply supply water to the cabin with a white RV type garden hose. Easily removed in the fall before freeze up and would be economical as well. 2. this would be a more permanent long term solution that would permit winter use. My idea is to use 2 curb stops. The first curb stop would be used to open/shut water from the well to the cabin. The second curb stop would be teed into the line between the first curb stop and the cabin. This second curb stop would be on the branch side of the tee and be in the off position when the line is pressured with water. When the water from the well is off (ie first curb stop is off), simply open the second curb stop and the water from the cabin would drain back to ground via the open curb stop, (maybe run this line back to the well if the aquifer water level is low enough?). BBTW Grundfos has some solar powered well options that might fit your needs. I wish I had some better ideas here, but plumbing is one of the more difficult things for me. A variation of your first idea is what I will be doing. My plan is to install a deep well hand pump from Oasis Pumps and freeze proof it by drilling a small (1/16″) drain hole in the drop pipe below the frost line. I will then use a garden hose attached to it to fill an indoor storage tank. The hose can be stored indoors to prevent it from freezing, and only be brought out when the tank needs to be filled. It’s not elegant, but it is simple and should be reliable enough for a weekend cabin. One aspect of my plumbing that I have given a lot of thought to is easy winterizing of the drainage system. I will be outfitting the sink and shower drains with HEPVO Waterless Valves so I never have to add antifreeze to the P traps. I will also be adding a similar type of trap to the “waterless” urinal to prevent it from ever freezing. The lowest point in the water pipes will be the faucet in the shower tub, so all I have to do is open one faucet to drain all the lines. HepVo looks like a good product. I wish it was a few years older and was installed in my 5th wheel – specifically my shower as it leaks! 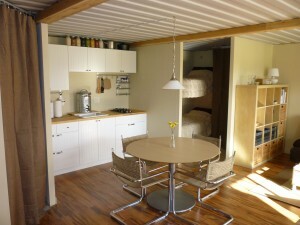 Starting our own shipping container project soon. We own one already but it is being used for storage. We are purchasing a second unit right now. Our challenge will be in using it at just the 8×20 dimensions but it will be primarily a guest house in addition to the cabin that’s already there. I don’t know if you’d want to go through doing it, but a way to keep the water from freezing in the attic tank is to use the chimney pipe to heat it slightly. Have a stainless steel tank modified with a pipe through it that the chimney pipe runs through, it still has to be drained when the cabin is unoccupied in winter, but keeps the water from freezing while you’re there. Excellent job! Everything is coming together quite nicely. As for a fridge – you can gut out that Coleman or any other DC fridge and ‘engineer’ a nice foam box to the exact size you need (you can laminate sheets together with good ole’ GE Silicone II and still remain carveable). Add a bit of tinted epoxy and fiberglass – voila! A nice fridge for much less than $500-$1000. And, in the exact dimensions you need. I’ve been pretty pleased with the quality vs. price I’ve gotten from US Composites. I live in Wisconsin also and can appreicate the concerns about a roof top tank freezing up. In older posts, you mentioned eventually putting in a solar panel system. Have you given any thought to using cattle tank heaters in a roof tank to prevent freeze up and heat tape on the supply line ? Trying to run a tank heater off a solar system is cost prohibitive. Solar just does not produce enough power for resistive heating. If I was grid tied I might consider it, but then I would have to worry about power outages and a burst tank. I’m trying to keep it simple. Finish your foundation to give yourself a crawl space. You can pour footings and then finish the ends with wood construction, glue foam insulation to the concrete portions of the foundation. This will solve some of your space issues and give you a insulated place for your plumbing. Then you can add a couple more solar panels to the south facing roof, upgrade your inverter, move your AGM’S, and keep your microwave. ps. your cabin will be easier to heat. I’m probably in the minority in not wanting a basement or crawlspace. It would also be very difficult to fill in the considerable gaps between the containers and the foundation as container bottoms are not flat. Even if I could close it all in, since it’s an off grid cabin there would be no way to heat the crawlspace during the winter months when I’m not there and anything inside would still freeze. I still may frame and panel the open ends with treated wood someday, but that would be mostly for some additional secure storage if I ever need it. As for heating, the smallest Jotul wood stove does a perfect job of heating it even in the coldest weather. I could have made the cabin energy efficient, but cut and split wood is VERY cheap up here, and I have 22 acres of woods if I ever want to do it myself. For your stove/ oven, you might look at the Camp Chef two burner stove with oven. They’re quite reasonable, and perform well. They will use the 1lb propane bottles, or you can plumb up to your larger setup. For the water problem, what about using 6″ black ABS pipe? In the summer, if installed on the roof exterior, you would get nice hot solar water. Drain it in the winter. The Camp Chef looks like a nice stove for camping, but I don’t think I would want to use it indoors. I think the Omnia will do most everything I need. Every solar water heating system I’ve seen seems more complex than I want to deal with. I think the easiest water heater to install, maintain, and use would be one of the instant LP units. Even so, I just don’t think I need one at this point. I think you’ll like the available options and low cost this offers. I’ve seen those and looked into them, but my SureSine 300 inverter doesn’t have enough power to start them. If I ever get a larger refrigerator, it’ll need to be DC powered. Hi. Grat site. Questin regarding your kitchen cooking stove top. What is the brand name? It may be in your questions and replies but I may have missed it. It’s a Kuppersbusch from Germany. It’s hard to find high quality 2 burner Propane cooktops in the US. Many tiny homes use RV cooktops, but I find those to be poor quality. Are there any concerns with the using the propane stove in such an enclosed area? Any plans to add ventilation to the outdoors. Cooking for me uses so little propane that I don’t have any concerns. I do have some passive ventilation from two of the original container vents, and I also usually keep one or more of the windows cracked for additional ventilation. I also try to use the wood stove whenever it’s running in the colder months to reduce my consumption of propane. I would be much more concerned with propane appliances such as refrigerators, ovens, and unvented heaters. Unvented propane heaters also create another problem for tight container buildings – excess humidity. Please note that I have a properly installed carbon monoxide detector, as should anyone using propane or natural gas appliances or a wood stove.